Imagine a time when a 12 year student could build a supersonic glider 2.5m / 8ft long, attach it to a huge helium or hydrogen balloon and take it to the edge of space, release it, fly it into a dive back to earth that will reach Mach 1.5 / 1,800kph / 1,120mph and land it. Well that time is now and the student is Jason Brand from Sydney Secondary College / Balmain Campus. He is in year 7 and has already broken plenty of records. Breaking the sound barrier will be another cool record. His flight will break a lot of other records too. The event will take 6 to 9 months to complete and the testing started 3 weeks ago when a non-aerodynamic payload (space chicken from Clintons Toyota) reached speeds of 400kph / 250mph with its parachute deployed. This is because the air is pretty thin up at 33.33Km or 1/3 the way to space. The space chicken was a simple test and we are now happy that we can easily fly at speeds of Mach 1.5 in the very thin air high up in the stratosphere. Left is a picture of the chicken falling back to earth at 400kph. Even the parachute could not slow the payload in the thin air. It slowed down as it reached 28Kms altitude and the air got a bit thicker. We have started fund raising as we need help to cover the enormous cost of Project ThunderStruck. If you can offer a dollar or two (every bit counts) we will love you. If you are rich and wish to really help, there are rewards. They are called “Perks” and we have some that I hope you will love. Some of our payloads will go supersonic before the big event, but they will not be aircraft. We might even donate one of our supersonic payloads to a generous contributor. Project ThunderStruck set to Inspire Kids Worldwide. is 12 years old. Can he make this a reality? Yes, he has the experience and the skills. More on that later. planet, yet a 12 year old student is set to inspire kids around the world with a daring project that is pure STEM – Science Technology Engineering Mathematics. It will make the seemingly impossible the domain of the young if they choose to break down the barriers imposed by themselves or others. Not only that, there is real science going on here. discussing with Jason the testing fo the transonic phase of the re-entry, that is, the part of the flight transitioning the sound barrier. Jason proposed that he create Project ThunderStruck and that his father asist with the project management. That is the hard part. We will have to do lots of testing and even the record breaking event will cost about $30,000 alone. The total cost will be $80,000 but we will only need $20,000 from crowd funding. If we make more, it will make our fundraising from sponsors a lot easier. Sponsors tend to come on board later, once they see progress. Your help now is essential. It gets us started immediately. Flying balloons to the edge of space for testing is an expensive exercise and we have a 7 hour drive each way to get into areas of low air traffic away from the major trunk routes. We also have to buy a lot of radio systems to allow remote control from the ground when the glider is up to 100kms distance. He is a 12 y/o student from Sydney Secondary College, Balmain Campus in Sydney, Australia. He carried out his first High Altitude Balloon (HAB) project at age 9 and was so inspired that he sat for his amateur radio license at 9 years old. Since then he has launched a total of 19 HAB flights and recovered all 19. Some flights were in Croatia where mountains, swamps and landmines are risks not seen in Australia. He is also the Student Representative for Team Stellar – A Google Lunar X-Prize team attempting to get a rover onto the moon. J ason appears on Radio and TV regularly and the picture right shows him talking about HAB flights on Canberra’s Fuzzy Logic Science Show in 2013. He is also a member of the Australian Air League, Riverwood Squadron. He plans to solo on his 15th birthday. His father Robert Brand is an innovator in creating low cost solutions for spaceflight. He speaks regularly at international conferences, is a regular guest lecturer on aerospace at Sydney University, writes about aerospace and takes a very “hands on” approach to space. He supports Jason’s project fully. The same way that the first pilots broke the sound barrier: in a steep dive. The problem is that since there is no engine and the biggest issue is air resistance, Jason will launch the aircraft from over 40km or nearly half way to space! He will get it there on a high altitude balloon. There the air is very thin. A fraction of one percent of the air at sea level. 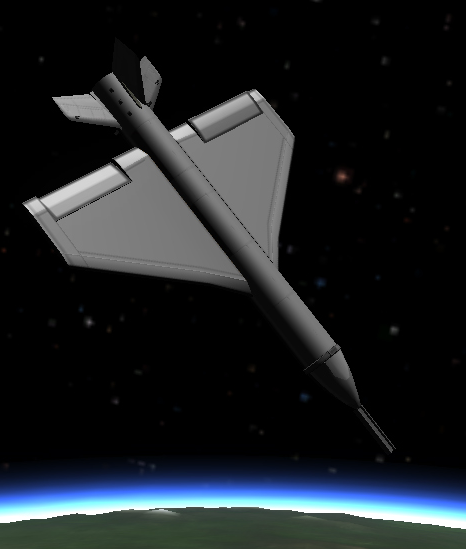 During the dive, the craft will accelerate to well over Mach 1 and less than Mach 2 and will need to be controllable by its normal control surfaces to pass as an aircraft. As the air thickens at low altitudes, the craft will slow and with the application of air brakes will slow and level off for normal flight to the ground. We will have a camera in the nose of the aircraft and it will transmit TV images to the pilot on the ground. Jason will be either in a darkened room with a monitor or wearing goggles allowing him to see the camera. This provides what is known as First-person Point of View (FPV). The aircrafts instruments will be overlaid on the video signal. This is known as “On Screen Display” or OSD. Below is a view typical of what will be seen by Jason as he lands the craft. The video signal must travel over 100kms to be assured of the craft being in the radius of the equipment. Similarly we must send commands to the control surfaces of the radio controlled aircraft. Again this must work at distance over 100kms. The craft has ailerons, elevators and rudder as well as airbreaks and other systems that need to be controlled. We will use a 10 channel system to ensure that we have full control of every aspect of the craft. We will have to buy a $5,000 GPS unit capable of sampling at what is essentially the speed of a missile. These are highly restricted items, but essential. We will record the speed with both this unit and radar. The unit will record to an SD card and also send back telemetry every second. It is essential to knowing the speed during the flight rather than waiting until after the event. We will also need a radar responder to allow other aircraft and air traffic controllers to know where our craft is at any time. We can expect global TV News coverage of the event and many records to be broken. The day will start by filling a large Zero Pressure Balloon like the one pictured below. The balloon will carry the aircrafy to over 40km where it will be released and go into a steep dive and break the sound barrier. As the air thickens, the speed will slow and the craft will be pulled out of the dive and levelled off to drop speed. The aircraft will eventually land and data and video records will be recovered. We will already know the top speed, but there is nothing like solid data rather than radio telemetry that may miss the odd data packet. There will be opportunities to attend, but it is likely to be in a rather remote part of the state. The flight will be broadcast over the Internet and the opportunity to track and follow the flight will be available to all. All up the opportunity to be involved is high and the science and inspiration will be out of this world. Project ThunderStruck is set to thrill. Visit our projectthunderstruck.org website for more ThunderStruck stories. Visit our wotzup.com website for more space and balloon stories. 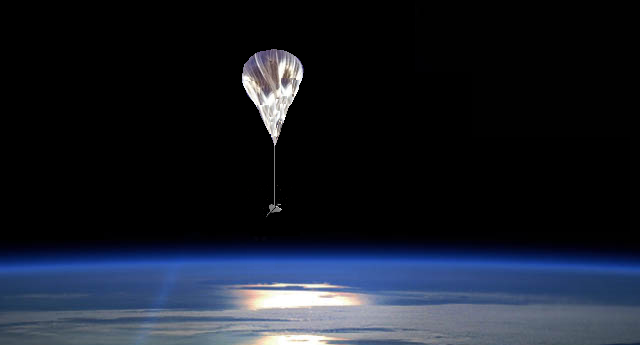 Below is an artist’s impression of what the view will be like prior to launch at +41Km altitude. This entry was posted in Event, Staff and tagged "Robert Brand", Amateur Radio, Apollo, event, sound barrier, Staff, ThunderStruck by Robert Brand. Bookmark the permalink.